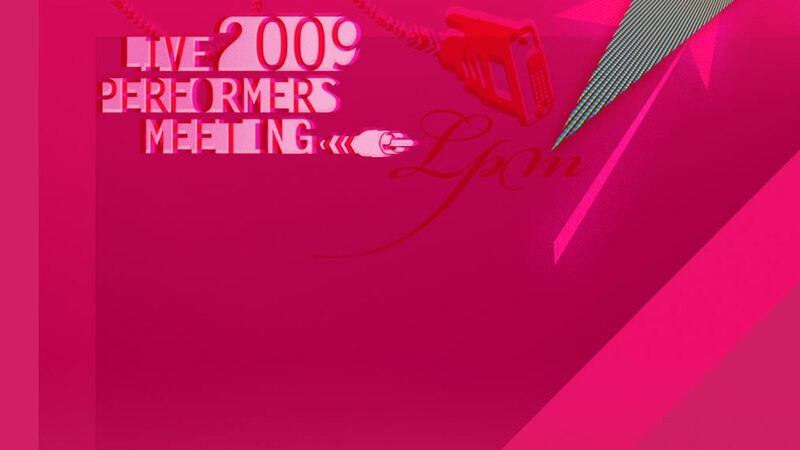 From 28th to 31st of May 2009, at Brancaleone in Rome, will take place the seventh edition of LPM – Live Performers Meeting: International encounter of live video performers, visual artists and vjs, dedicated to live video performances. LIVE VIDEO is the main focus of the four days and each day is highly characterized by the diverse themes and scenes contributing to the event. The protagonists of this first day will be all the vj and visual performers of the broad roman scene, reunited for the first time in one only day and location. At the core of LPM there is the ideology of free software for audio/video mixing. Thanks to the community of “FLxER” and the Linux Club in Rome, LPM has been able to flourish and give back to worldwide community of live video performers. This year there will be a whole day dedicated to the live video scene connected with the concept of digital freedom. Not just Free softwares, Free hardwares, Open contents, Open sources, Hacking, among the protagonists of workshops, showcases, performances and vjsets, but also REFF, with the exhibition of the first artworks submitted to the contest RomaEuropaFakeFactory, curated by ArtisOpenSource and Marco Scialdone, dedicated to the artworks of artists, creativity passionates, law professionals with special interest in copyright, all inspired by the theme “Freedom Remix”. A whole audio-visual culture surrounds the 8bit scene; the video performers interested in these specific sounds and aesthetics will perform with 8-bit – and electropop musicians. With beats generated by nintendo sounds, samplers or synthetizers and toys, human voices processed with vocoders or various strange filters, we shall see what comes out of the mix. It certainly should be amusing for audience and participants alike. Video performances and vj sets are typically found flowing with the intense sounds and the relentless beats of electronic club music. And you’ll find that here too, imagery following and interpreting the rhythm of the freshest Breakbeat and Drum n’bass, and from 2am to 4am going with the pulsating Techno and Electro sounds. A full day of Queer independent culture, an event of the several projects which are working on a national and international level to experiment with the language of representation in terms of gender, politics and sexual orientations with the aim of deconstructing stereotypes and ideological power relationships. There will be background videos and music for dinner, and after dinner dedicated AV performances and vjsets. As usual, at the end of the evening, open time for VJs will take place: vjs can perform freely, taking advantage of the many available video consoles, beamers and monitors. LPM 2009 maintains the spirit of a meeting, which has been its main characteristic since the first edition. It is conceived to be a place for comparison and exchange of information and ideas among vjs, visual artists, live-video performers and passionates. Experimentation is one of the founding elements of its ideology. LPM is a non-profit organisation where any gained funds are invested back to support the research and development of the live visual field. Similarity of ideals and common roots has prompted the LPM to become member of the Avit network, whose aim is to improve and promote the culture of veejaying events worldwide. After the first festivals in England, the Avit network expanded worldwide, establishing collaborations as in C23 in Germany (AVIT Berlin) and Vision’r in France (AVIT France) and LPM in Italy. This partnership of “network” and “meeting” is possible thanks to the common cultural background and the strong affinity of spirit and purposes. The subscription to join LPM is FREE and is open now until the 30th of April, 2009. For details on how to subscribe, see the “participate” section of the website. LPM is produced and organized by Flyer Communication (www.flyer.it), Linux Club (www.linux-club.org), FLxER.net (www.FLxER.net) and FLV – Flyer Live Visuals, with thanks to the cooperation of important international partners.